CHICAGO — Soybean prices have traveled a slippery slope in recent days, “exploding,” as one market analyst observed, on Jan. 17 after a series of ups and downs in days previous. During the Top Producer Summit in Chicago, analyst Jerry Gulke and colleagues had issued generally grim forecasts for soybean prices before things turned around that morning. Soybean prices jumped higher, taking corn and wheat with it, according to a Farm Journal report. “I guess exploded to me means we’re up a dime or so,” said Gulke, president of The Gulke Group, with tongue apparently firmly in cheek. Farm Journal correspondent Jo Windmann observed that with rumors about Brazil’s weather and China’s tariffs circulating, along with a lack of crop supply data due to the current federal government shutdown, it’s hard to tell if Thursday’s price spike should be credited to the rumor mill or to continued volatility. According to Gulke, the U.S. is still sitting on too many beans and Mother Nature will be the ultimate price determinant. WAUKESHA, WI. — Research scientists funded by the soybean checkoff, including scientists at the University of Illinois, are developing new sources of genetic resistance and new soybean cyst nematode resistance management strategies. This is according to the SCN Coalition, which issued a news release on Jan. 15 detailing how university researchers are discovering, stacking and testing new resistance genes. The researchers include Brian Deers, a U of I plant breeder whose team has identified two new resistance genes from wild soybean (Glycine soja) that have proven very effective when bred into commercial soybean (Glycine max) varieties. 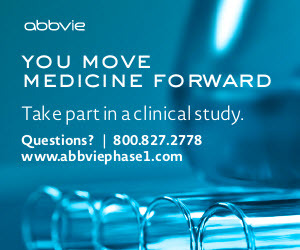 When stacked with another resistance gene from PI 567516C, along with the major gene Rhg 1 from PI 88788, the new genes create a four-gene stack. “We found that by combining genes from different resistance sources we could obtain much higher levels of resistance compared to using one source,” Deers said. The new gene combinations are currently being tested in greenhouse trials at the University of Missouri Bond Life Sciences Center. When the four-gene stack is rotated with the Peking source of resistance — which is currently used in just 5 percent of commercial soybean varieties — scientists have documented a slowing of SCN populations adapted to PI 88788 over generations, they say. 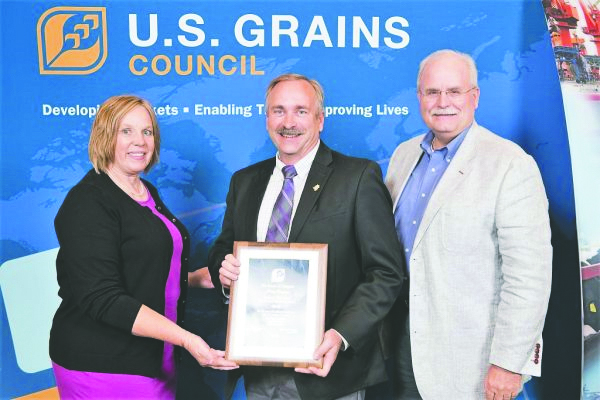 DENVER, CO. — Illinois Corn executive director Rodney Weinzierl was recognized for 30 years of service to the agricultural community during the U.S Grains Council 58th annual membership meeting in Denver earlier this month. 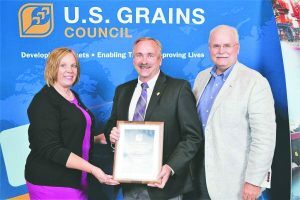 While serving in leadership roles with Illinois Corn, Weinzierl has worked with USGC to communicate with worldwide grain customers to promote long-term relationships and expanded markets for U.S. grain. Weinzierl is a graduate of Illinois State University in Bloomington who farms in Stanford..
CHAMPAIGN — The USDA Natural Resources Conservation Service Edwards-Lawrence-Richland-Wayne-Wabash County District group and Earth Team volunteer Janet Billington have received the NRCS’ traveling award for FY 2018. Illinois NRCS state conservationist Ivan Dozier traveled to Fairfield last week to meet Billington — who volunteered 340 hours of hard work to get more conservation on the ground in her district last year — and the rest of the district group.